Atlas Shrugged is a novel by Ayn Rand, published by Random House in 1957. All of the following points must be present to ensure a true first edition / first printing. The applicable printing numbers are listed in brackets when known. 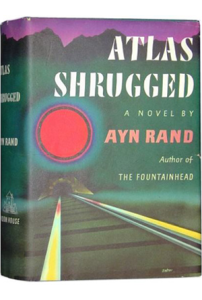 Ayn Rand, born Alisa Zinov’yevna Rosenbaum, first got the idea for Atlas Shrugged in 1943 when a friend asserted that she owed it to her readers publish a non-fiction book about her philosophy. Her response, “what if I went on strike? What if all the creative minds of the world went on strike?” became the central idea of her next novel. Indeed, the working title of the novel was “The Strike” until her husband Frank O’Connor suggested “Atlas Shrugged” in 1956. Due to the success of her previous novel The Fountainhead, Rand had no trouble finding an interested publishing house. Before even beginning writing numerous publishers had approached her with interest, but her contract with Bobbs-Merrill gave them the first option. After seeing a partial manuscript, however, they asked Rand to make a number of changes- which she refused to do. Bobbs-Merrill rejected the book. Bennett Cerf, an editor at Random House, proposed that she submit the book to multiple publishing houses to see how they would respond to the book’s ideological content. She took him up on that offer and sent the manuscript to three of the twelve publishers who had expressed interest. Based on Rand’s subjective grading scale, Random House scored the best and so they would ultimately publish the book. 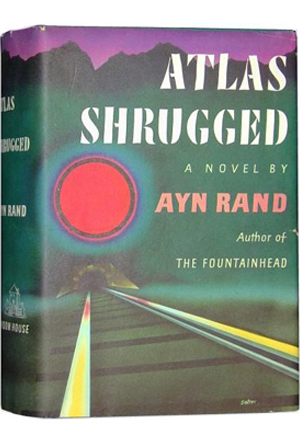 On October 10th, 1957, the 1,168-page Atlas Shrugged was published for $6.95 in a massive print run of 100,000 copies. Despite being mostly disliked by critics the book sold extremely well, holding a spot on the New York Times bestseller list for 22 weeks. A paperback edition was released by New American Library in 1959 in an initial run of 150,000. This entry was posted by jwsipkins. Bookmark the permalink.